SKU: N/A. Categories: Chocolate, Chocolate Covered Fruit, Nuts & Fruits, Chocolate Dipped Fruit, Glazed Fruits, Black, Red, White. Tags: belgian chocolate, candied cherry, cherry, chocolate, chocolate dipped, dark, decadent, glazed fruit, gourmet, hand dipped, katz, long stemmed, maraschino cherry. 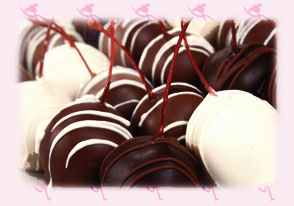 Candied Maraschino Cherry hand dipped in The Chocolate GIRL’s, rich blend of Dark Belgian Chocolate.